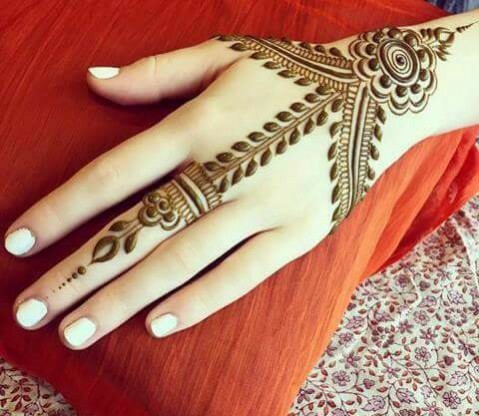 6 Minimal and Trendy Mehndi Designs for Women of Today! 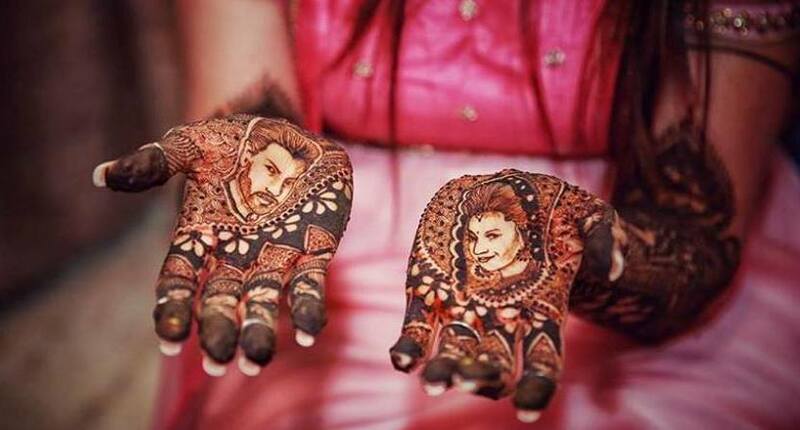 Karwa Chauth is here and you are still confused with the mehndi design? 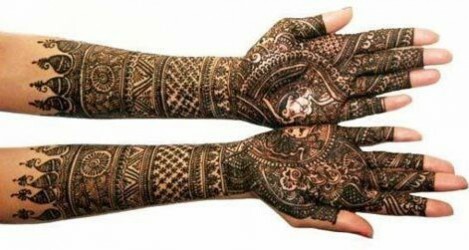 It’s quite obvious as well because like you desire to get dressed in the best way, it’s obvious to desire getting hands adorned with best mehndi design. 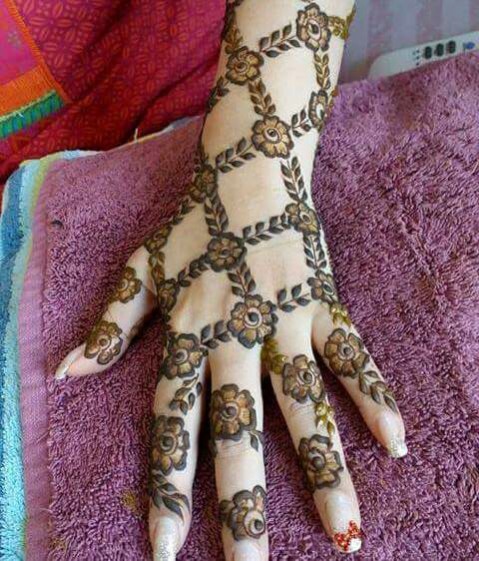 But, for that, you need the best henna designs too. Thus, for all those willing to get best but minimal or trendy Mehndi design on their wrist, this blog is a must read. These days, women are very specific about the Mehndi design they wish to get their wrist adorned with. And, what the women of today love are the minimal trendy mehndi designs on their wrist. These are easy to make and are very unique patterns to embellish hands with on the day of Karwa Chauth. The pattern of mehndi that is high on trend these days are the geometric patterns. 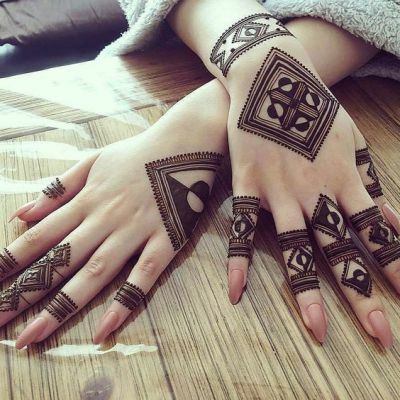 Squares, triangles, circles and other shapes designed in unique styles with henna definitely give a unique appeal to the wrist. No wonder, geometric patterns are stylish, unique and interest seeking too. 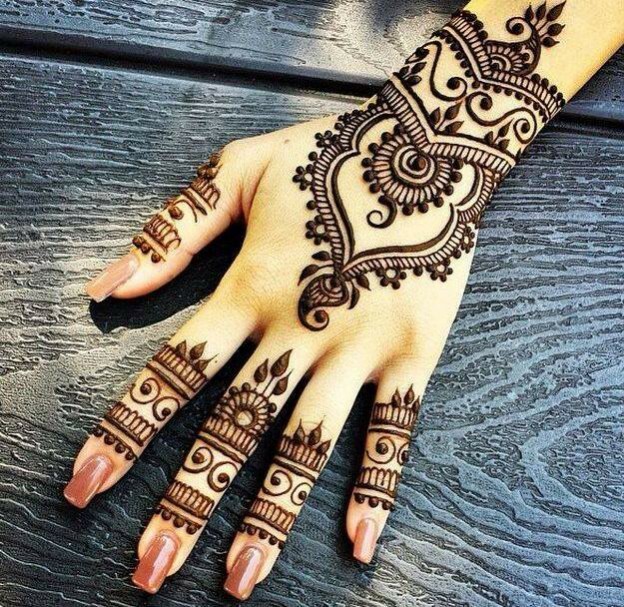 If minimal design you want to get on your hands with henna then little artistic patterns you must try to look up for. Designs that cover your fingers and hands partially with artistic designs and patterns are very much trend these days. You can consider the image below here for little arty pattern. One henna pattern that never goes out of trend is the jaal pattern. 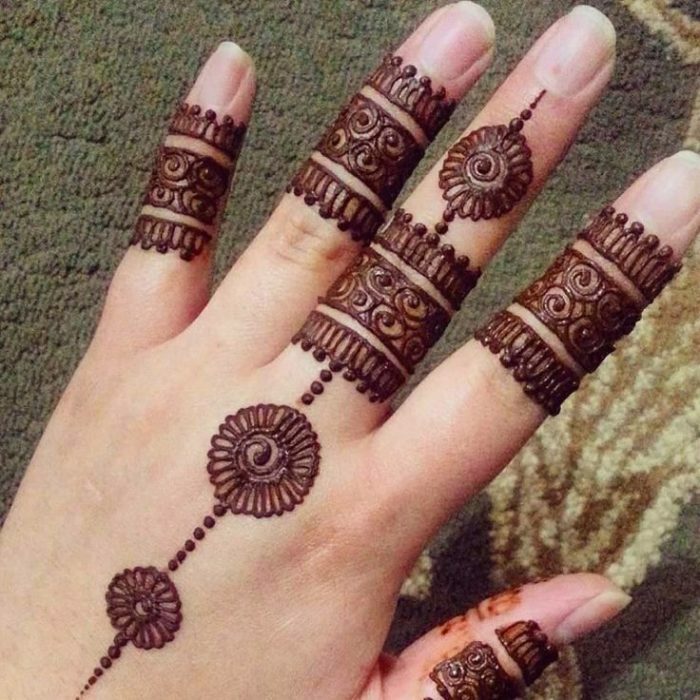 To keep in tune to the latest mehndi style, you can get your hand adorned with little or narrow jaal mehndi designs here and there like the one shown in the image below. For the women in love with minimal designs of heena, twirling leaf designs around the fingers till wrist is beautiful to get wrist adorned with. Such designs are loved by people of every age. And, among young girls, such leafy patterns are extremely loved. 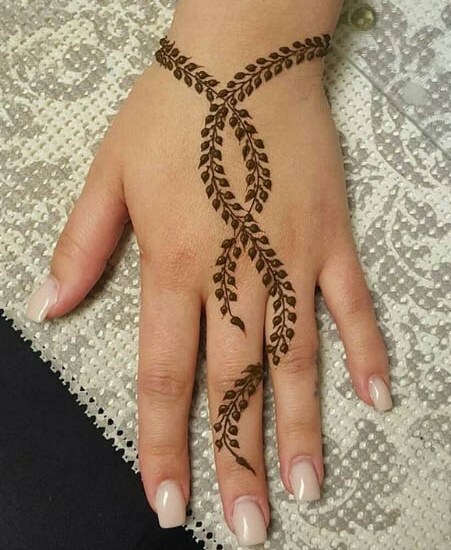 To stand out with your henna design, unique patterns are the ones to look up for. You can get your wrist adorned beautifully with such patterns that will definitely seek the interest of everyone. These days a lot of unique designs covering the fingers and minimal patterns on the fist or wrist is making a trend among the women of these days. 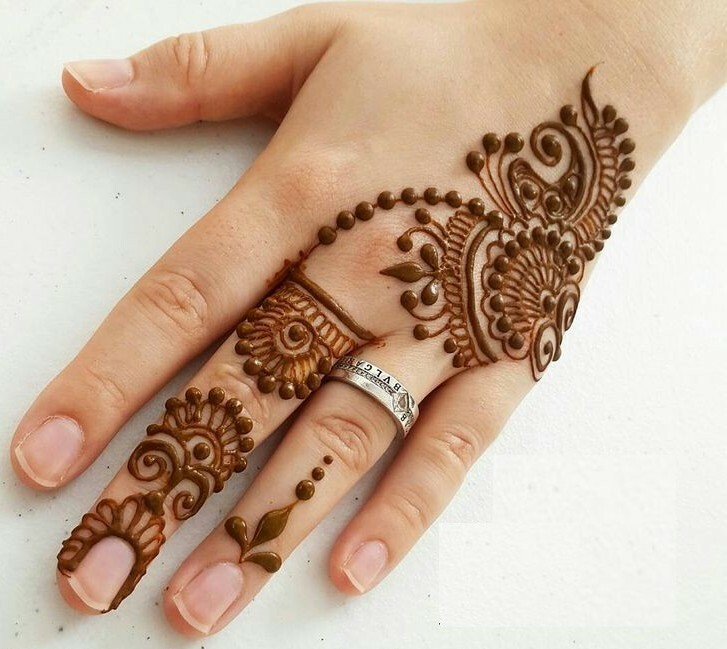 Another very trending mehndi design pattern to get on your hands this Karwa Chauth is the Half Hand Mehndi design pattern. It’s trendy, unique and definitely very attractive to flaunt on your hands. Also, such patterns of henna are quite easy to create on hands. The one on the image below is not just beautiful but very trendy design to consider. Hope you liked our suggestions and found the best one to get designed on your hands? 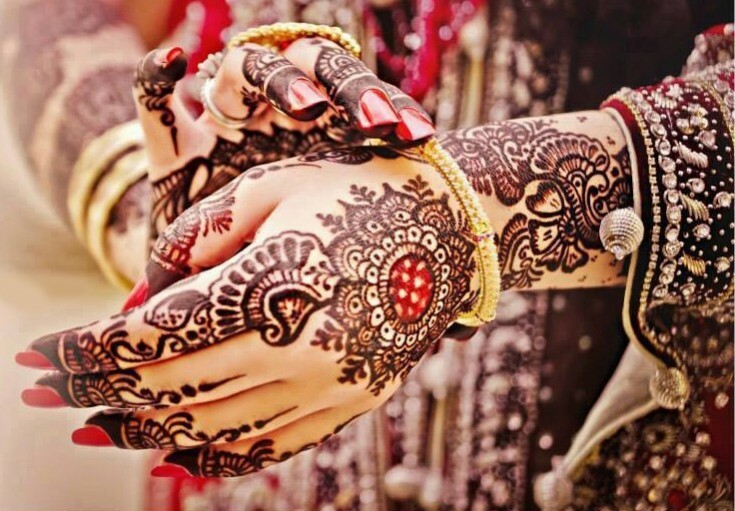 We hope the color of the mehndi on your hand come out to be the darkest this Karwa Chauth and let you know how much you are loved by your loving husband. Wishing all a very Happy Karwa Chauth!! The awaited festival of Karwa Chauth is now just a day away making it the perfect time to get hands painting with an exquisite Mehndi designs for every married women or for the girl soon to marry her fiancé. Mehndi designs are an outcome of art practiced over years. However to apply mehndi on hands and feet on Karwa Chauth is the mandatory ritual of the festival. So here for you are some exquisite Mehndi Design patterns to choose from. If you love Arabian Mehndi designs a lot then a design pattern like this is the one to choose. 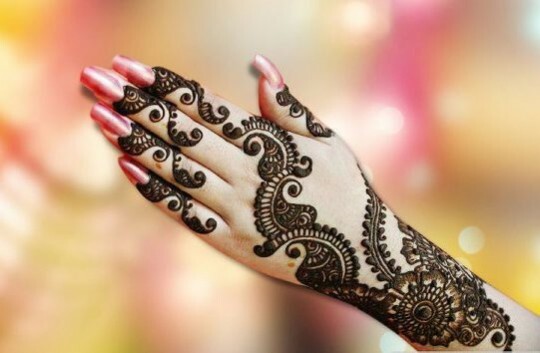 It’s minimalist Mehndi designs of Arabian mehndi pattern that can turn your hands instantly beautiful. You would in fact love to flaunt this Mehndi design a lot. 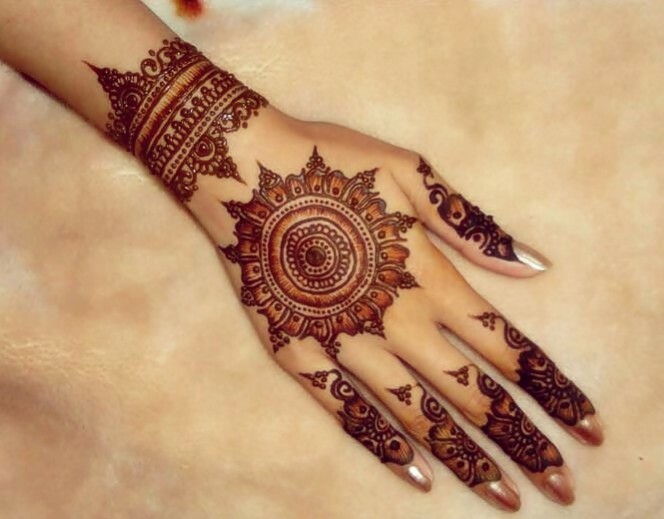 If you are fond of trendy mehndi designs then this kind of circular mehndi designs are much in trend these days, which you can choose to get your hands designed with. It’s one of the most exquisite Mehndi designs indeed. It’s another very trendy and much popular Mehndi design these days. 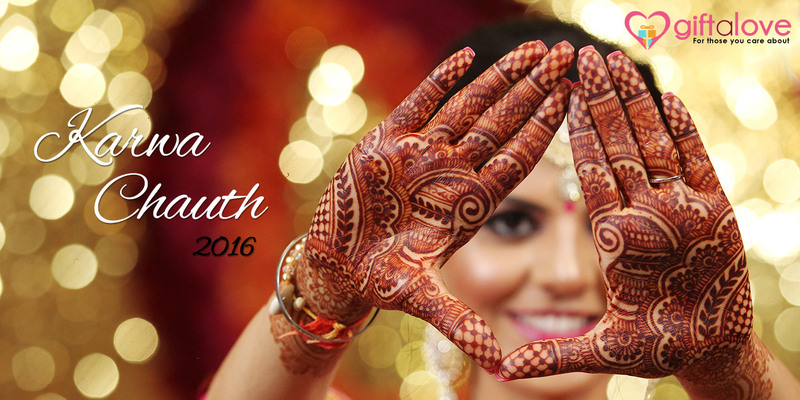 So this Karwa Chauth flaunt beautiful indo western Mehndi design on your beautiful hands. It’s not so common but a very beautiful Mehndi design to choose for getting hands painted on this Karwa Chauth. It gives a prominent design patterns and also gives a dark and long lastin impressin on hands. 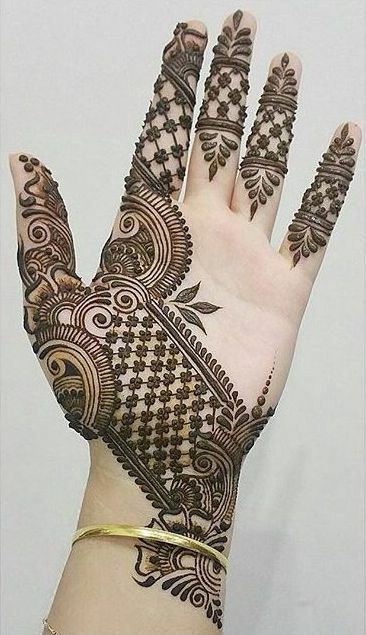 For the ones not so crazy about Mehndi but for the sake of rituals can go for this kind of Mehndi design patterns that are unique as minimalist to get hands designed with on Karwa Chauth. 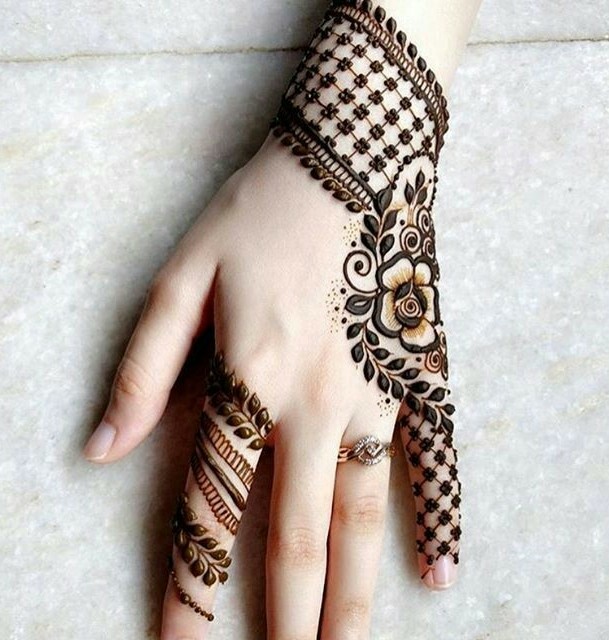 It’s not just unique and latest Mehndi design patter, it’s exquisite and awesome to flaunt on the day of Karwa Chauth celebration. Such lovely and unique designs of Mehndi are a craze among youngster these days. 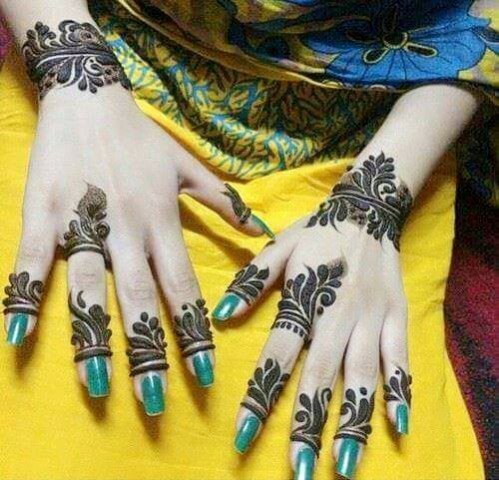 This is the most preferred Mehndi design among the new married women and others too. It’s a design that gives the bridal feel again on being applied to hands. You can get it applied on your hands if you wish to get that bridal feel again on this Karwa Chauth. If finding the right Karwachauth gifts makes you go nuts, hang on. You need not fear the consequences of not finding a gift for your beloved wife, as we’ve got you covered. Karwa Chauth is one of the age-old rituals in which married women seek the blessing of the Almighty for the longevity of their husbands. The festival is dedicated to the sole bond of a wife and a husband who share all sorrows, happiness, ups and downs together. They support each other in every walk of life. That’s what the beauty of marriage signifies. As the celebration is just a few days away, husbands have started the hunt for the most suitable gifts to claim their wife that they love unconditionally. If you’re one of those lucky persons, keep reading. Shower her with a silk saree: As Karwa Chauth includes the long-standing traditions that showcase the cultural values of India, choose a gift that signifies the same theme. Take luxury to the next level by gifting her a silk saree. Silk is luxurious and a traditional ensemble in this fabric is a celebrated possession. 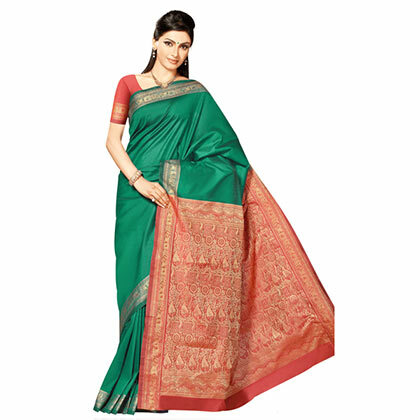 Get her favorite color and buy her a silk saree this karwa chauth. Jewellery box: If keeping her jewellery is a kind of chore, it’s time to get her a box. An aesthetically pleasing jewellery box surely would be something valuable. 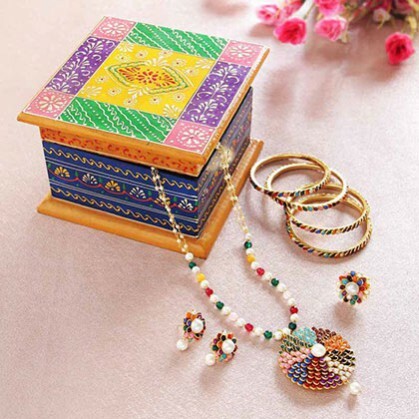 Choose a box that has many compartments and gift it to her this karwa chauth. While she would feel happy to get it, you would also be able to let her know you love her! Cosmetics: Women can never have enough cosmetics. Their love for beauty products is just incomparable. This Karwa Chauth 2016, say you care for her with a pack of cosmetics. Won’t you like to see her beautiful every day? Then get your hands on a few cosmetics and get it wrapped. Give her favourite sweets: After the daylong fast, she would really crave for something delicious. Treat her taste buds with something delicious that she loves to eat. From desserts to traditional sweets, choose something that she would love to relish. 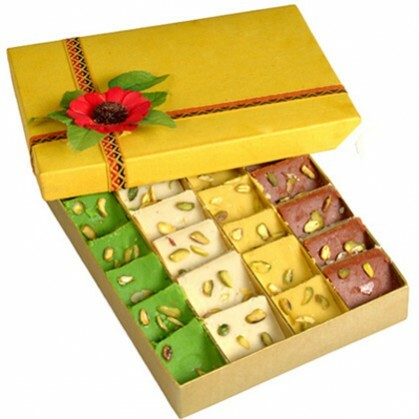 There are ladoos, rasogullas, soan papdi, peda, barfi, kaju katli and many more to choose from. 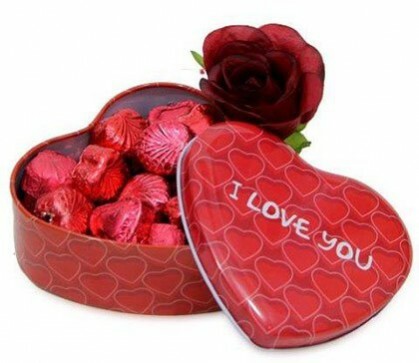 Grab a box of chocolates: Nothing says one’s love loudly than a pack of chocolates. Almost everyone loves to indulge in chocolaty delight so as your wife. This Karwa Chauth, grab a box full of candies and her favoruite chocolates. She would surely love this gift of yours. So, you people who seem to be anxious or out of ideas to find something unique for upcoming festival of karwa chauth, don’t worry. Just keep calm and get inspiration from above listed ideas to make this festival unforgettable for her. 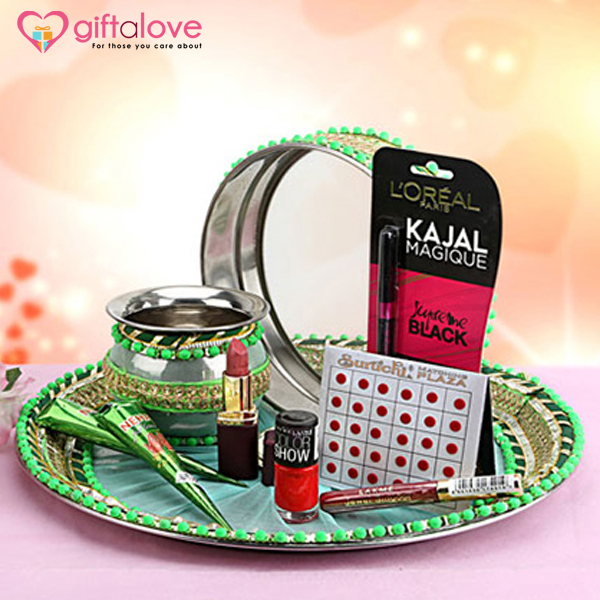 What’s there for Karwa Chauth Shopping at GiftaLove? Karwa Chauth, the auspicious Indian festival is now just few days ahead making it the best time to start shopping for the festival. Therefore GiftaLove is back again with its extensive collection of Karwa Chauth gift items that has everything which is required to celebrate the festival with great devotion. No matter if your search is for Karwa Chauth Gifts or Karwa Chauth shopping items, at GiftaLove, you are to come across everything that is required to celebrate this cheerful Indian festival that strengthens the bond of love and care shared by husband and wife. On the day of celebration, every woman follows a fast to get blessings of long life of her husband. So for this auspicious Indian festival the portal has come up with auspicious Karwa Chauth gift ranges as well. For performing auspicious rituals of the festival of Karwa Chauth puja, the portal offers wide range of Karwa Chauth Puja items. 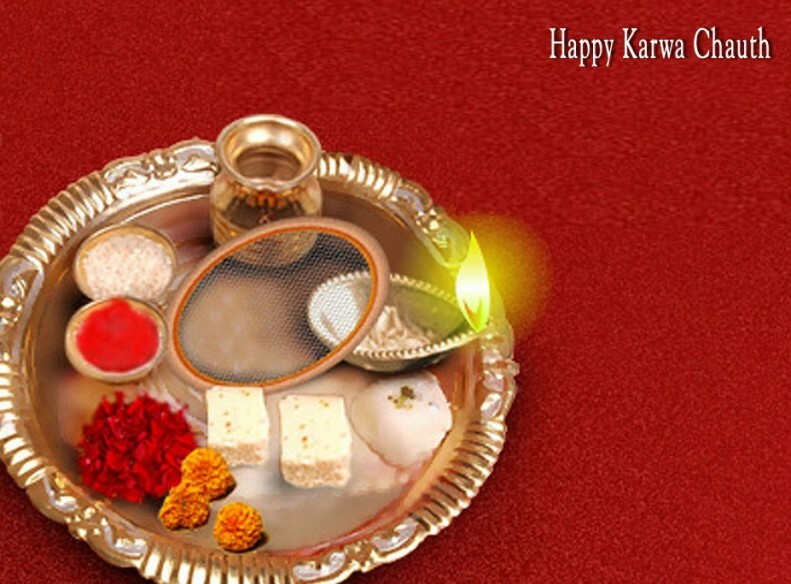 The most important thing of the Karwa Chauth celebration is Karwa Chauth Thali and channi (sieve). Thus at the portal there is puja Thali, channi, sweets, roli, chawall, jiya, kalasha and many other Karwa Chauth puja samagri available to buy online. Sargi is the important ritual of Karwa Chauth festival. It is the morning meal that married women relish before they start their day long fast from sunrise to moon rise. Thus for sargi, there is exclusive range of Karwa Chauth sargi gifts that mother-in-law gives to her daughter-in-law and vice versa. At the portal the range of Sargi for Karwa Chauth is made inclusive of many amazing eatable or sargi special eateries like dry fruits, sweets, mathri, fresh fruits, chocolates and more. Another very important segregation for Karwa Chauth festival at the portal is Karwa Chauth Gifts. It is the exclusive and extensive array of gifts that are perfect to make her happy. Be it a search for Karwa Chauth Gifts for mother-in-law, daughter-in-law or wife, there is plenty of gift choices for everyone. Sargi items, sarees, designer suits, jewellery and lot more is there to explore and buy online at market leading prices. So what are you still wondering when karwachauth.giftalove.com is there to cater your complete Karwa Chauth shopping needs online. All that you need is to make your visit at the exclusive range of Karwa Chauth gifts online at the portal and start exploring to figure out the best Karwa Chauth gift online which is hard to get anywhere else. 4 Impressive Karwa Chauth Sargi Gift Choices…. 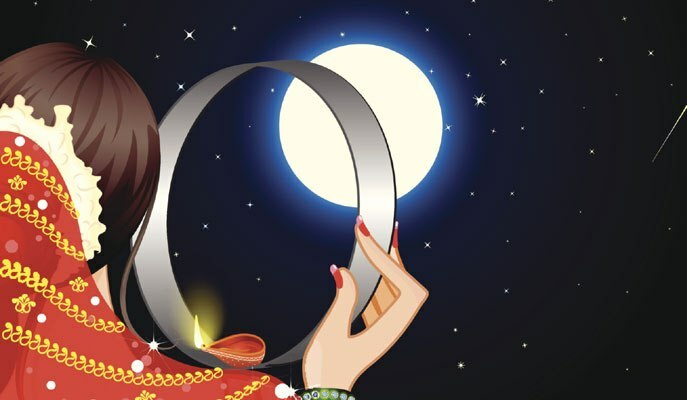 Is the thought of Karwa Chauth Sargi gift is making you confused? 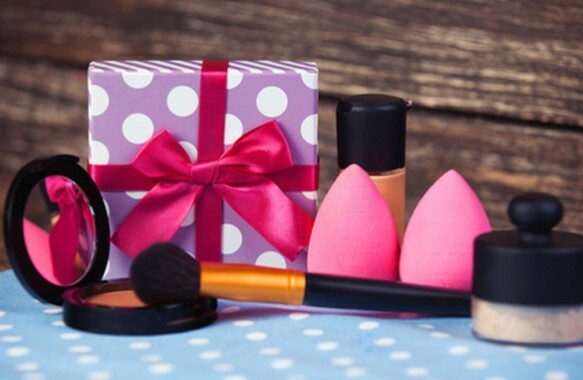 Want some quirky ideas on Karwa Chauth Sargi gifting? If yes then this is the best page for you to be. Here in this blog, you will get many amazing Karwa Chauth Sargi gifting suggestions to present your dearest daughter-in-law or mother-in-law on the upcoming Karwa Chauth celebration day. Gifting on Karwa Chauth is a significant way of expressing of love and care to dearest wife, daughter-in-law or mother-in-law. So, now when the auspicious festival of Karwa Chauth is approaching fast its best time to get started with Karwa Chauth gift shopping. But if the thought of Karwa Chauth Sargi gift is making you feel perplexed then all that you need is to make your visit at the exclusive collection of Karwa Chauth Sargi gifts at Giftalove. For dearest daughter-in-law, this gifting option is simply excellent. It is a tray of cosmetics fir her to beautify her looks for the Karwa Chauth evening and a pack of dry fruits to be eaten in the morning as Karwa Chauth Sargi. For the auspicious festival of Karwa Chauth a gift of suspicious Karwa Chauth Thali is simply excellent. Also on the portal there are plenty of beautifuklly crafted Karwa Chauth Puja Thali choices to explore in the Karwa Chauth Sargi range of gifs. A Decorated Puja Thali with decorated sieve and other puja essential will definitely prove an excellent sargi gift for your dearest daughter-in-law or mother-in-law. If you wanna make Karwa Chauth Sargi gift a healthy token of love for your dearest mother-in-law or daughter-in-law then all that you need is choose this gift hamper from the offered range. It offers many selections of delicious Sargi for Karwa Chauth that is inclusive of healthy Dry fruits Laddu and crunchy Mathrees to have in the morning as Sargi. On Karwa Chauth, one gift that will win every daughter-in-law’s heart or mother-in-law’s heart is Karwa Chauth Puja Thali with a set of dazzling jewellery (necklace and earrings). No matter how many jewellery she already have in her collection, a new one with a decorative Puja Thali will definitely make her happy. There is lot into the range of Karwa Chauth Sargi gifts to explore at the portal. So now when with every passing day, Karwa Chauth 2016 is approaching fast, it’s time not at all to waste. Rather hurry to make your visit at GiftaLove that is also offering the ease to buy and send Karwa Chauth Sargi Gifts to India or abroad residing daughter-in-law, mother-in-law or wife. Karwa Chauth, the auspicious Indian festival is one of the biggest days of celebration for Hindu married women of India. It is the festival of expressing love, sacrifice and celebrating married life. Thus sharing here in this blog a recipe of Vermilian or Seviyan Kheer with is the most important dish of Karwa Chauth Sargi. For every married women in India, Karwa Chauth is the most awaited and special festival celebration. It is the celebration of married women as they fast for the entire day (from sunrise to moonrise) for long life and well being of her husband, get traditionally dressed and performs rituals of breaking the daylong fast with view of the moon and husband. But before all this, the day of a women starts with the ritual of Karwa Chauth sargi which is a menu of things which is eaten by a married women before the sun rise on Karwa Chauth. It is gifted by a mother-in-law to her daughter-in-law. 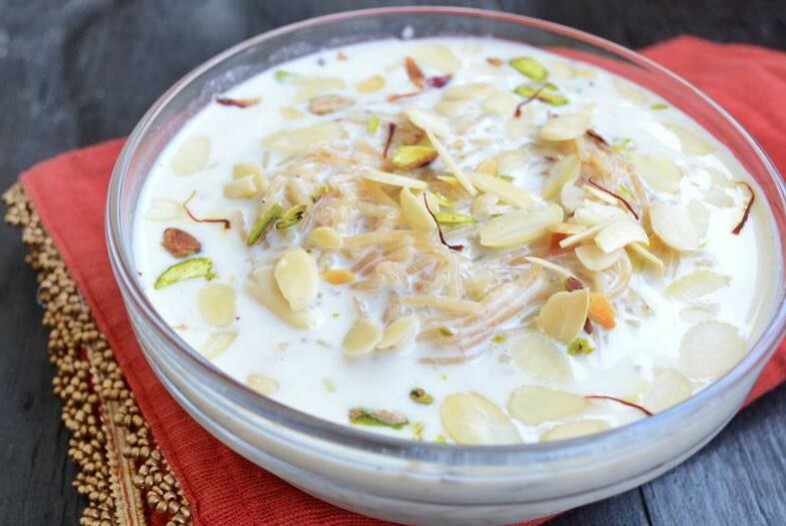 So to add that extra dose of sweet into your Karwa Chauth Sargi platter, here I am sharing recipe of delicious Vermicelli kheer, which is basically known as Seviyan Kheer. • First heat ghee in a pan. • Then fry the cloves and cardamom till it start releasing their aroma in the ghee. • Add the vermicelli/seviyan and fry till it starts turning golden brown. • Now it’s time to pour milk and let it boil. • Further add sugar into it and mix everything well. • After this lower the flame and let the milk turn thick for 5-7 minutes till the seviyan gets cooked. • Lastly add chopped almonds or any dry fruits in it. • Your Seviyan Kheer is now ready to be served hot, warm or cold. • If you want to serve it cold, then refrigerate it and then serve later. 1. The recipe Seviyan Kheer for Karwa Chauth Sargi can be easily doubled or tripled. 2. Use fresh & good quality milk. 3. The amount of seviyan/vermicelli can be easily increased or decreased. Adding more seviyan adds more consistency and it will turn thicker like a thick pudding. The kheer consistency can be changed as per one’s liking or taste. 4. Dry fruits can be added in to Seviyan Kheer as per your choice. If available then some saffron or rose water can be added to the seviyan kheer for addition of more aromatic flavor. 5. The seviyan kheer tends to be thick in consistency when cooled. So if you don’t like thick seviyan kheer then skip the process of thickening the milk. Alternatively you can add some more milk to the seviyan kheer for thin consistency of your choice. Hope you liked my recipe for Seviyan Kheer and would love to try it to add it in Sargi for Karwa chauth. However for amazing Karwa Chauth gifts shopping or karwa chauth Sargi gifts, you can make your visit at karwachauth.giftalove.com . Since like any other Indian festival gifting is a major part of Karwa Chauth festival celebration too and is the conveyor of expressing thankful gratitude for a husband to his wife and for daughter-in-law and mother-in-law. Thus at the portal there is vast range of online Karwa Chauth gifts at attractive prices. 5 Most Preferred Karwa Chauth Gift Ideas for Impressing Your Wife! Karwa Chauth, the auspicious and popular Indian festival is now again on the list of upcoming festival of celebrations on the Hindu calendar of 2016. So it’s time again for all men to get started with shopping of Karwa Chauth gifts to make beloved wife feel special and loved. In fact this is the right time for every daughter-in-law and mother-in-law to start their search for online Karwa Chauth Gifts for each other. In India, Karwa Chauth is one of the most popular Indian festivals that come as a day of opportunity for every married woman to show and express her hearty feelings of love to her beloved husband and to her mother-in-law as well. Basically on the day of Karwa Chauth celebration, married women are on fast for long, happy and healthy life of her husband. Being on fast and worshipping Karwa Mata on the day of celebration are the rituals for married women to pray for long & healthy life of their husband. This fast is strict as married women don’t even sip water the entire day from sunrise to sunset. 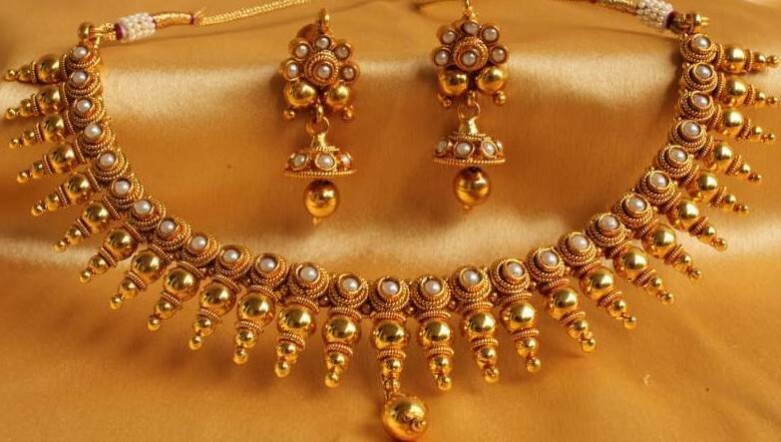 To make your beautiful wife happy instantly on the day of Karwa Chauth, a traditional Necklace set will be an excellent gift choice for the Karwa Chauth festival. 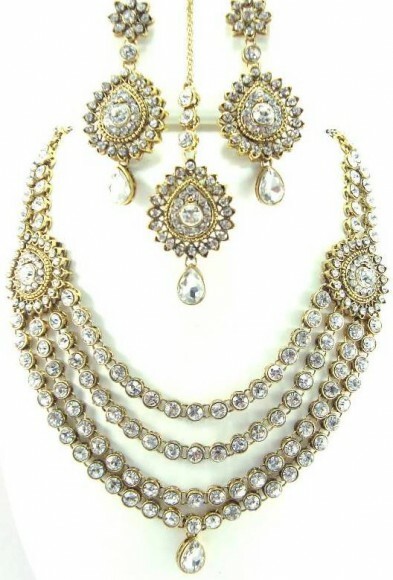 Since every women gets in traditional Indian outfit and does the ‘Solah Singaar’, thus a traditional necklace set will definitely add into her beauty and singaar. To help your dearest wife look more beautiful and radiant on the day of Karwa Chauth celebration, a cosmetic hamper would be an excellent gift. Not only it’s an excellent gifting option to make your wife happy instantly but is also a useful gift to help in her ‘Solah Singaar’. Just choose a cosmetic hamper with cosmetics from a renowned brand name. If your budget allows then gifting a Diamond studded Jewellery for her as Karwa Chauth gift is best for her radiant smile and dazzling looks. Be it a diamond ring, diamond pendant set, diamond studded bracelet, bangles, set of earrings or any other jewellery you choose for her, she is sure to feel loved and special on being your better half. Gifting a trendy designer saree on Karwa Chauth is never to fail in impressing her and making her feel loved and special on this festive day. It’s an excellent Karwa Chauth gift as she will love to wear it on the day of Karwa Chauth and flaunt in style. If jewellery and saree you have already gifted to your wife as Karwa Chauth gift then a classy handbag is an excellent gift choice too. 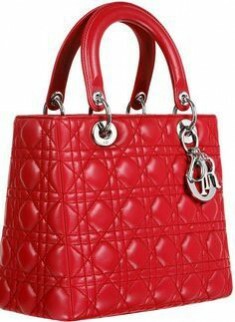 You can choose a trendy and classy handbag of her choice or can choose gifting a classy clutch to her as well. She will in fact love to carry and flaunt it in style on the day of Karwa Chauth. Gifting on Karwa Chauth is the best way of conveying love and expressing thankful gratitude to wife. So make your choice for Karwa Chauth gift for wife wisely. 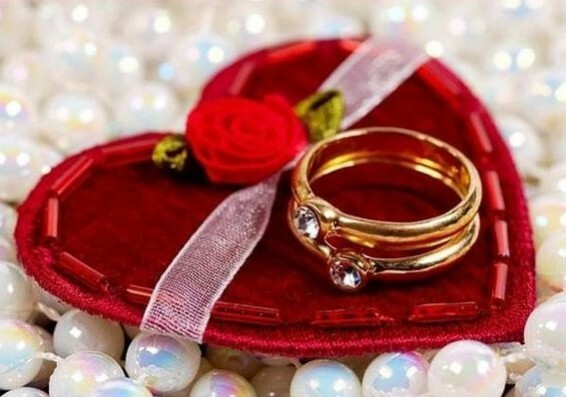 However if your search is for Karwa Chauth gift for mother-in-law or daughter-in-law then you make a search at Giftalove.com that also provides an ease to buy and Send Gifts Online in India. Add More Love in Karwa Chauth Celebration with Exclusive Gifts of Karwachauth.Giftalove.com! Are you feeling perplexed over the idea Karwa Chauth gifts to surprise your dearest wife? Well then it’s time to say good bye to your confusion as you are here you will get many amazing ideas on Karwa Chauth gift ideas that are sure to make her happy and feel special about. Karwa Chauth is one of the most joyous festivals of India that is celebrated by the Hindu Indian women. It is an auspicious festival of Hindus that is celebrated because of many mythological tales or reasons. The festival of Karwa Chauth is basically celebrated by Hindus women by being on a whole day fast that is from sunrise to sunset to impress god and get blessings of her husband’s long life. In return to the feeling of love and care of wife a husband greets and make her feel special with a Karwa Chauth gift. Also a Karwa Chauth gift is given by a daughter-in-law to her mother-in-law. In regard to this mother-in-laws also greet their dearest daughter-in-law with different sort of sargi gifts that is a platter consisting of different types of eateries that every married women consumes on Karwa Chauth before sunrise. Thus gifts play a very major role in the Karwa Chauth celebration to make every married woman feel special and loved as well, either by husband, mother-in-law and daughter-in-law. Thus Giftalove that is a name for one of the popular online gift selling websites of India has come up with a vast array of Karwa Chauth gift options for the ones willing to surprise her with something special or for the ones residing far away from dear one: A Designer Saree: For your dearest wife or for mother-in-law the best thing to choose gifting is a designer saree. At the portal here you can explore an amazing collection of designer saree options to choose and buy online as a Karwa Chauth gift for wife and that too at much attractive price point. A Traditional Jewelry: For the daughter-in-law, mother-in-law or wife, one of the best Karwa Chauth gift is Jewellery. There is also vast variety of jewellery options to choose and buy as well. It can be anything from a bangle set, necklace, pendent with chair, pair of earrings, rings, bracelet and many other things as well to choose and buy online. 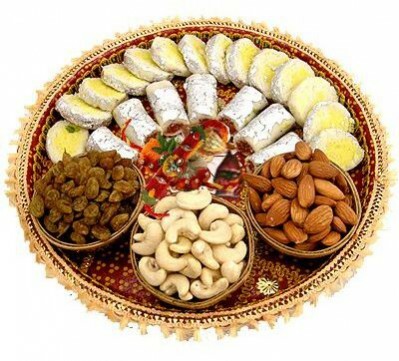 A Karwa Platter: For daughter-in-law or mother-in-law a Karwa platter is obviously one of the best and one of the most relevant gifting options to choose buying. 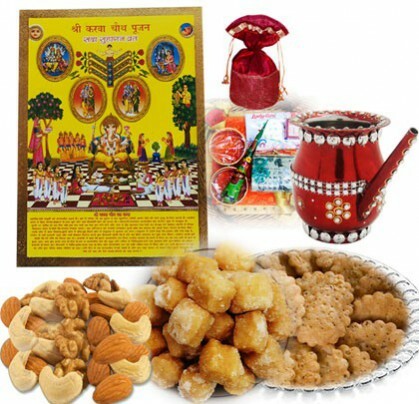 It includes a variety of sweet delights, namkeen, karwa essential, puja essentials and lot more. It is in fact a perfect gift for the festival of Karwa Chauth. Sweets Hamper: Be it for anyone that you are willing to buy a Karwa Chauth gift that is either for daughter-in-law, mother-in-law or wife, sweet hamper is simply a perfect gift for all. Also there is vast variety of Sweets Hamper available on the portal to choose buying such pack of Rasgulla, Gulab Jamun, Soan Papdi, Kaju Katli and lot many other such options as well. So this time when you are confused over the idea of what to buy and choose on this Karwa Chauth for gifting, simply log on to giftalove.com/karwachauth that is offering a vast variety of Karwa Chauth gifts at attractive price point. Apart from the above mentioned gift options, you can explore a range of many other gift options as well. Also you can explore ranges of gifts for other occasions and celebrations falling round the corner.